Is your character archetype rare? Are your feat choices rare? Is your multiclass combination rare? Is your game day rare? About a year ago FiveThirtyEight published a short article called “Is Your D&D Character Rare?”. It was a product of a deal between Curse and FiveThirtyEight which meant the data was not available to anyone else. I was a little jealous that I couldn’t play with the data and disappointed that they only counted class race combinations and called it a day. Shortly after, I released a few tools (1,2) for a popular mobile application (3) which allowed me to collect my users’ character data. After 3.5 months of data collection I have a whopping… 885 unique characters in my database that I can play with. Well… I’m not as popular as DnDBeyond but I don’t see anyone else waving around hundreds of character sheets for us to data mine, so it’ll have to do. To start with let’s redo the table from FiveThirtyEight. I am not going to pretend like I have many thousands of samples so instead of per 100,000 this shows class and race combinations per 100 characters. In FiveThirtyEight’s table, characters with multiple classes count once for each class. Here I divided multiclassed characters based on the proportion of their class levels. For instance, a character who is a Fighter 5/Rogue 15 will add 0.75 to the rogue count and 0.25 to the fighter count. Homebrew and UA classes are removed. Despite the methodological differences, these results seem to correlate well with DnDBeyond data (Spearman’s ρ=0.74) even though we seem to disagree on the exact order of popularity. 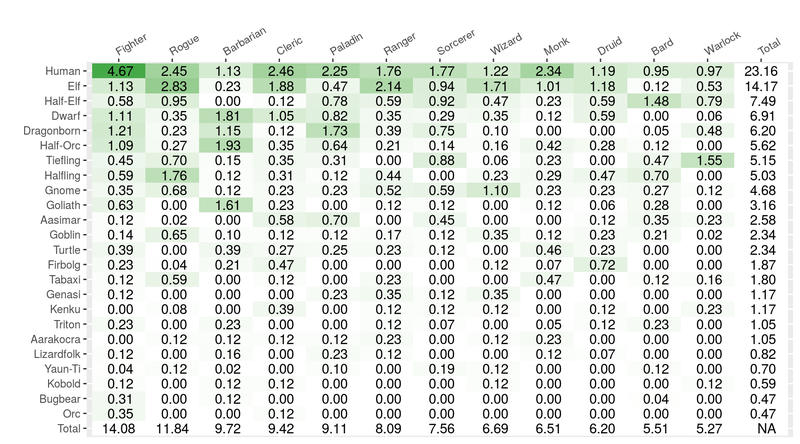 Graph below shows the % occurrence of a class/race combination in DnDBeyond data as presented in FiveThirtyEight and my data. This is a little hard to visualize in a single plot. Alas we are short on space so you’re going to have to mouse over to see the details. Each colored section shows a character archetype’s proportion to the rest of the archetypes for the class. They are ordered from bottom to top in order of frequency, so the brown always show the most popular archetype and it goes downhill (but upwards in the plot) from there. 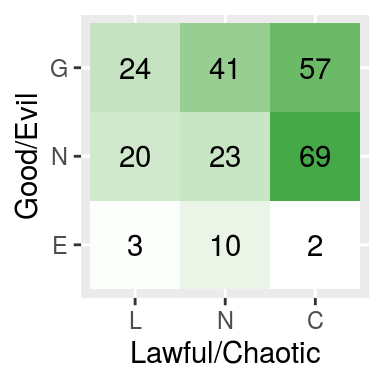 The plot below shows character counts for each alignment. In general, lawful characters seem to be out of style these days. Let’s see how are the tendencies for individual classes. Below graph shows a mean alignment for each class. Multiclassed characters’ contribution is calculated as before. You can mouse over to see sample size and mean values. The numerical values are distributed from 1 to 3. 1 is Chaotic/Evil, 3 is Lawful/Good on the corresponding scales. Darn! Most of the space in this graph is wasted. Even good old paladin has a chaotic tendency. Seems like 5e really helped players to break tradition. Meanwhile, Warlock is predictably the evilest class. We can also do the same to backgrounds. Since they probably explain more than a character’s back story than a class does we might get more information. 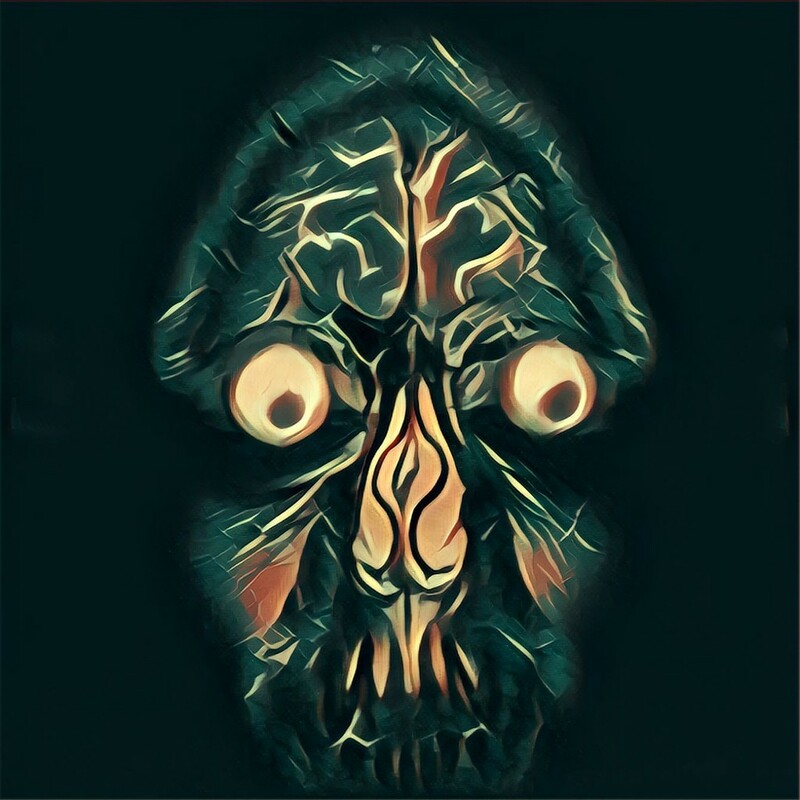 This looks better. On extremes we have Knights who tend to be lawful, Folk Heroes and Hermits on the good, Bounty Hunters, Charlatans, Urchins on chaotic and Criminals as the only background left of Neutral on the Good/Evil line. Obviously next logical step is racial profiling. Take that racism! Half-orcs tend to be nicer characters than humans (Disclaimer: Like most, if not all of the one to one comparisons you can make here, difference between Half-Orc and Human “goodness” is not statistically significant, p = 0.37). Alas, Tieflings are as close to Chaotic Stupid as they are stereotyped as. Another piece of D&D data: a majority of D&D characters don’t use feats. Many players love the customization possible with feats, but a larger group of players is happy to make characters without feats. Feats are, therefore, not a driving force behind many players’ choices. We can see whether or not our data agrees. On a surface look 33% of all characters have at least one feat. However, this is partially caused by the fact that a significant portion (46%) of our characters are between levels 1-3 and unless they are variant humans, they cannot have feats. We can see that by higher levels, feat adoption rates increase significantly, suggesting that once given the opportunity, players are likely to pick a feat. It can be postulated players spend most of their time between levels 4-15. 51% of all characters in this range has at least one feat. As I later discovered, this also somewhat correlates with the data in DnDBeyond though the percentages here are higher overall. Note: I am getting messages about how this clearly shows how Crawford was super wrong. That’s not very accurate. It is true that my data shows a higher proportion of feat adoption than the D&D beyond data, however we cannot conclusively reject the statement “a majority of D&D characters don’t use feats” due to possible sampling errors. If we take level 4-15 interval into consideration, our sample size is 446. Based on this we have a 5% margin of error (95% confidence) on that 51%. Next step is to examine which classes picks which feats, and which feats are the most popular. The graph below shows which feat is selected the most and by which class. Multiclassed characters are merged into their own category to reduce clutter. Any feat that is selected only twice or less is removed. Again, mouse over the bars to see details. It is surprising that Elven Accuracy, a feat that is added in a supplement and restricted to elves, is as popular as many core book feats that are known to be highly effective. 10% of all elves and half-elves have this feat. Its appeal to both ranged weapon attackers and casters seems to make it a good choice for elves from many walks of life. Another interesting bit is that the Magic Initiate feat seems be very popular amongst classes with spellcasting ability. I was always under the impression that Magic Initiate’s main use case would be to add some magic to a mundane class. We can also look into how feats synergize with each other. The network below shows how often feats are selected together. Unique connections are removed. Node sizes represent how many times a feat appeared together with another feat. The thickness of the lines between the nodes are determined by the number of characters both feats appear in. Before I say anything, I have to declare the connections in this graph aren’t particularly strong. There are too many feats and I have too few characters for high number of feats to appear together. The strongest link in this graph is based on 7 observations. Yet, as it stands, the connections seem quite intuitive, so we are probably not staring at noise here. 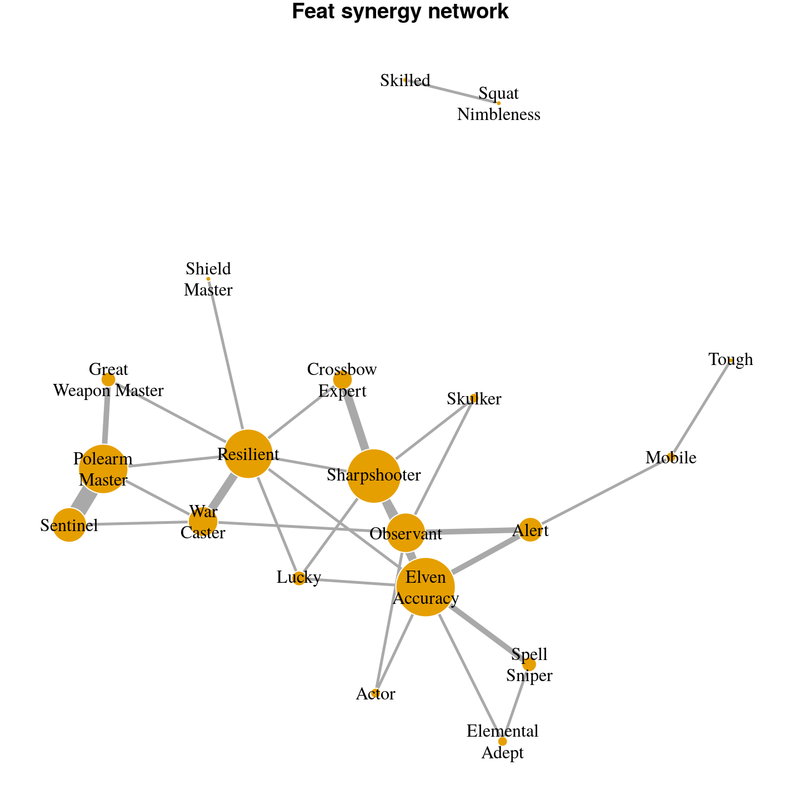 Robustness of elven accuracy is visible in this graph as it is both selected by characters trying to optimize their ranged and spell attacks. Crossbow Expert-Sharpshooter is known to be an effective combination to boost damage. Sentinel-Polearm Master is amazing for battlefield control. Since our dataset includes multiclassed characters, we can see which classed tend to appear together. Note that our sample size much smaller here (122 characters). Node sizes in the network below show how many times a class appeared in all multiclassed characters. The thickness of the lines between the nodes are determined by the number of characters both classes appear in. For instance, we see that most rangers multiclass with rogues, while most rogues multiclass with fighters. 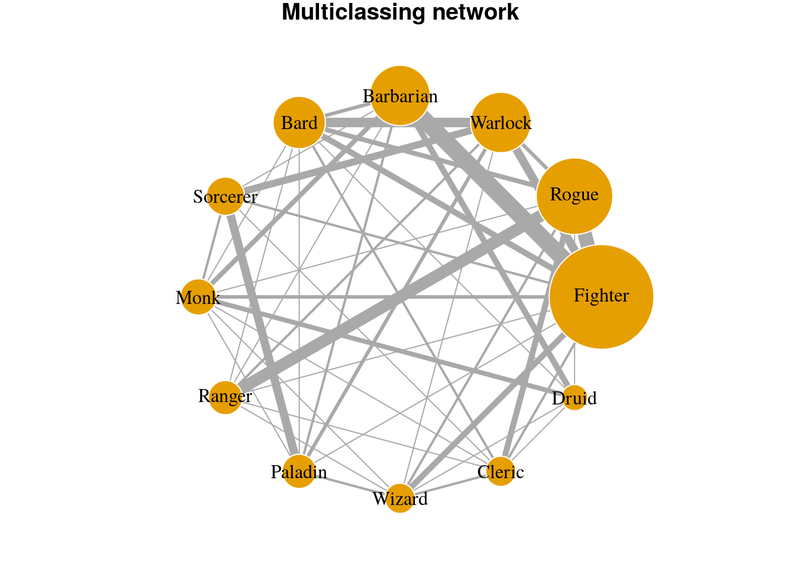 While this network is good to show which classes tend to be chosen together, it doesn’t give much information about how classes are distributed. 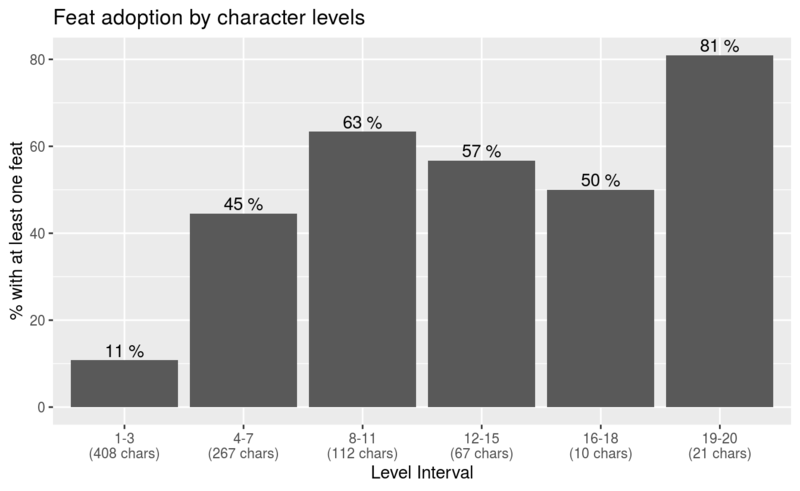 In the below graph we look at what is ratio of class levels in individual characters. A Fighter 5/Rogue 15 would appear as a 25% data point in the Fighter column and 75% in the Rogue column. This will give us information about which classes are dipped in and which ones are used as the main class.